Pretty clever, eh!? We are SO excited to have the huz’s burger in the Final 4 and would totally appreciate if you could help us vote. The winner’s burger not only will become a fixture on the Sidetrack menu (so cool!! ), but also, the winner will receive free burgers for one year! 1. Email weloveburgers@yahoo.com and indicate that you’d like to vote for the BBQ Slaw Burger. Your votes are highly appreciated! This Skillet Lasagna recipe is probably one of the better recipes that I’ve tried so far in 2011. Using hot Italian turkey sausage as the protein, and zucchini for added bulk with minimal calories, makes for a healthy, guilt-free dinner that is full of flavor. Plus it’s extremely easy to make, and involves only a few dirty dishes. 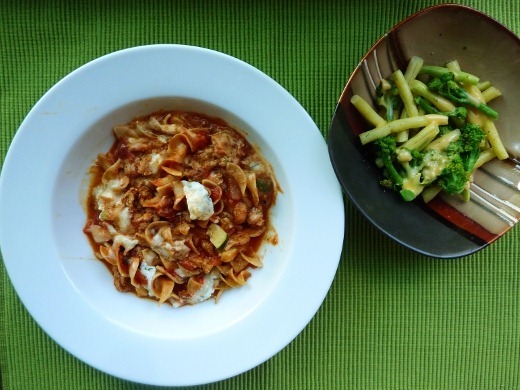 The pasta is cooked right in the skillet, so you don’t even have to boil a pot of water! I made this recipe again this week, and served it with a side of steamed yellow beans (they tasted just like green beans!) and broccoli, both from my CSA box. I tried another new soup recipe this week and it was probably one of the easiest soups to make… ever. Basically, the only labor involved was to slice corn off two cobs from my CSA box, and to slice up a cup of scallions. And from there, I basically tossed sautéed scallions, pre-cooked diced ham, canned white beans, chicken broth and chopped green chilies in a pot, brought it to a boil, and ate it! 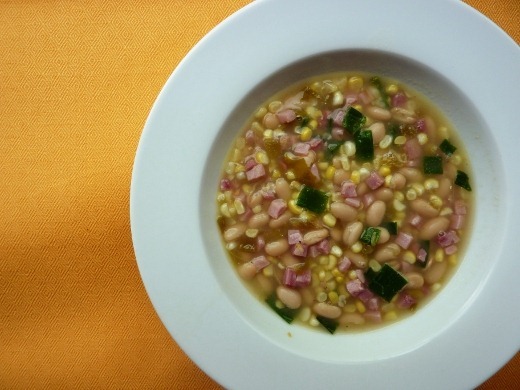 I liked this soup – it had a nice heat from the canned chopped green chilies, and a nice texture from the corn, ham, and beans. 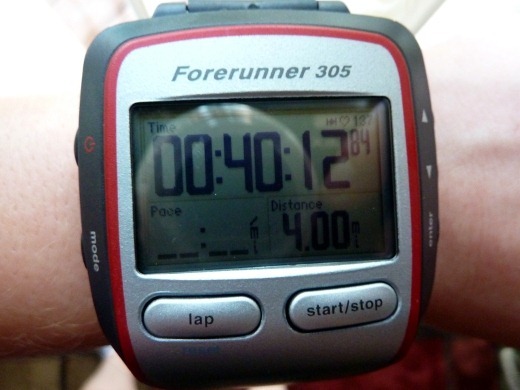 I ran a few times this past week, with my longest being a 4 miler. I signed up to run a 10k this October, but I am a bit nervous I won’t be able to build up to running that far (6.2 miles) in time. We’ll see! At least now I have a goal to work toward. The finish line is the 50 yard line of the Big House. Umm..awesome?! This beer was pretty great! I detected a strong earthy flavor, almost like pine, or evergreen? It had a bit of a bite to it – the Jolly Pumpkin website uses the word “peppery” as a descriptor, and I’d have to agree. It had a crisp, dry finish when sipping. Good stuff! 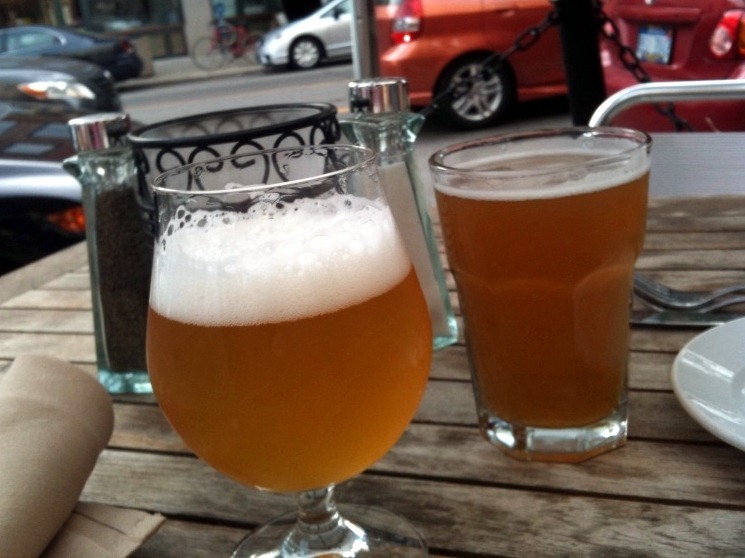 My dining companion ordered Jolly Pumpkin’s Bam Biere. Ann Arbor has some nice locally brewed beer. 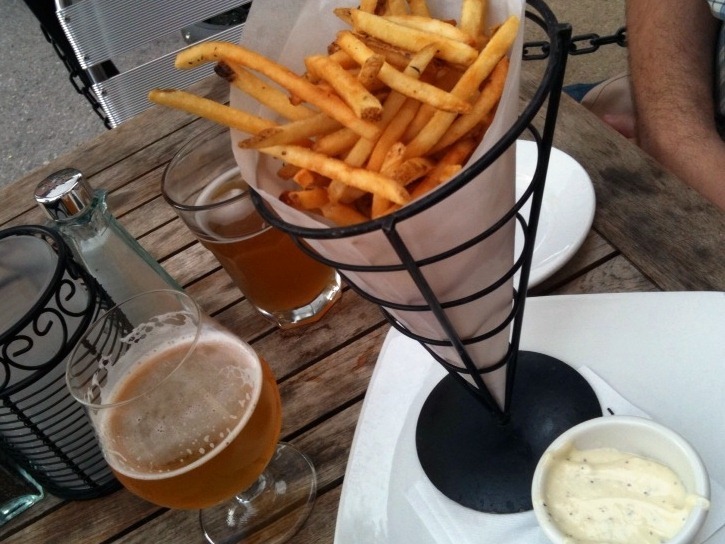 Just like our last visit, we ordered a basket of Truffled French Fries to inhale snack on. These were rather fantastic. The rosemary fries and the woodsy, piney beer was a perfect pairing, IMO! 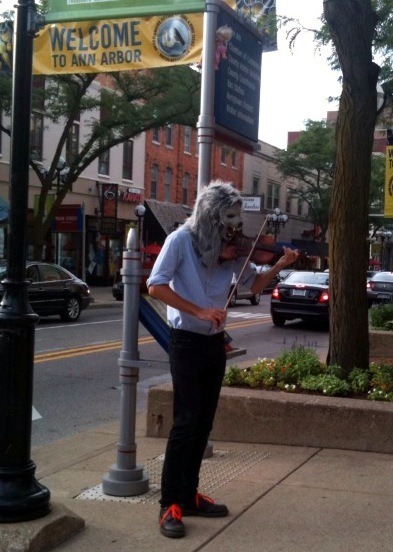 After beer + app, we took a stroll down Main Street and passed Violin Monster. For dinner, we ate at The Black Pearl, which is somewhat swanky inside. I loved the large straw palm frond-inspired fans that slowly spun on the ceiling. It was pretty dimly lit inside, with most of the surfaces being black in color. I liked the vibe. 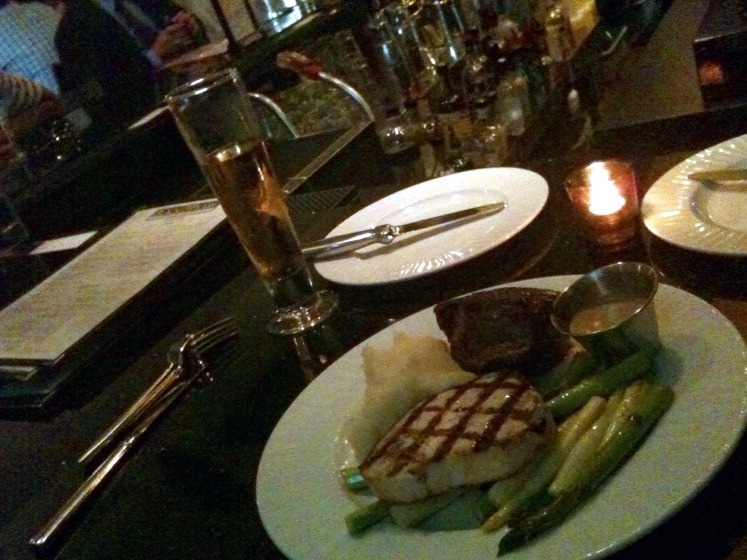 Rather than wait 30 minutes for a table, we hopped on up to the crisp black granite-top bar area for dinner. Black Pearl had a pretty interesting martini menu, but I decided to save several dollars and instead order my favorite beer, Eddy Fitz! Just can’t pass it up when it’s on a menu (even though it wasn’t on draft). 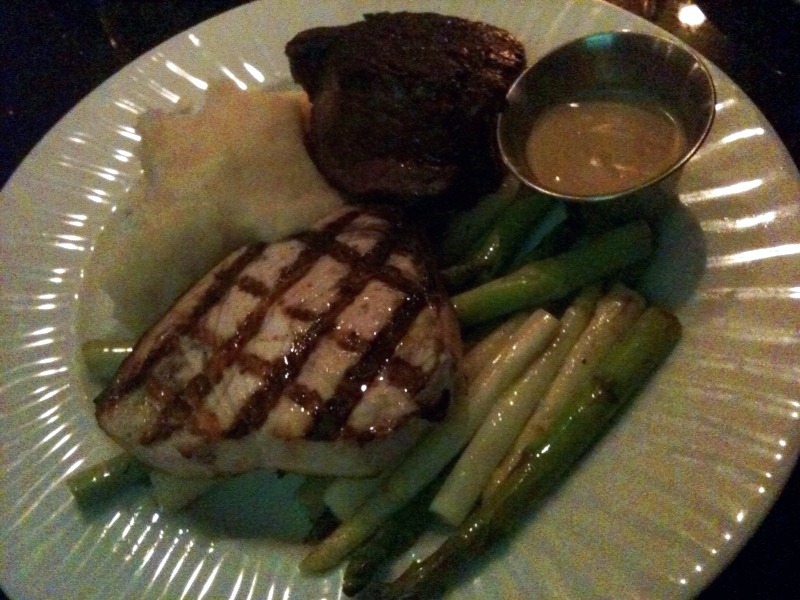 To eat, we ordered the Surf & Turf for Two to split, with a nice, thick Filet Mignon and a meaty Swordfish steak. Swoon! The mashed potatoes were very garlicky and super smooth, and the asparagus still had a nice bite. The Filet was oh-so-good. I took the plunge and ordered it cooked “medium,” which was pretty rare for my usual taste, but OMG it was good. I might be converting to ordering my steaks medium from now it. So buttery! Especially with the dipping sauce, which basically taste like butter + cream. After dinner we saw a late showing of Rise of the Planet of the Apes. Honestly I wasn’t a huge fan of the movie, but it was decent evening entertainment I suppose. 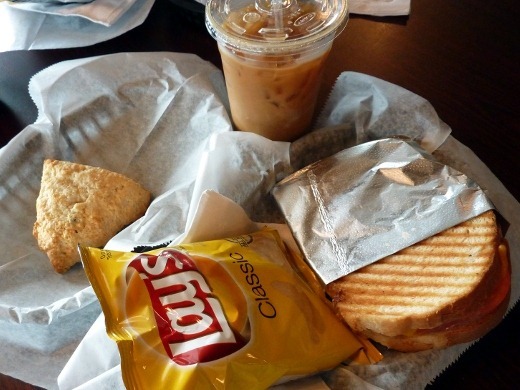 Yesterday on Living Social I bought not one, but TWO deals, one of which being a $9 lunch-for-two deal at Brewed Awakenings Café in Saline. We each picked out a sandwich and a baked good, and for a couple dollars extra, we got something to drink. As you might expect, I ordered Iced Coffee. Strong and rich – just how I like my men coffee! First I sat down with my iced coffee and cherry scone… Most people would start eating at this point, but since I wanted a picture of my whole meal for the blog, I waited for my panini to arrive. Voila! The panini arrived! 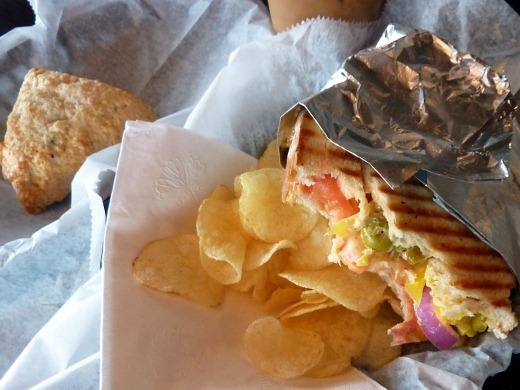 My dining companion and I both ordered the Monterrey Panini: “Turkey, salami, cheddar cheese, fresh tomatoes, red onions, mild peppers, green olives, and our special seasoned mayo grilled on ciabatta bread.” Banana peppers AND green olives!? Sign me up! My two favorites. I wanted to show the interior of my cheesy panini, so here it is after a few bites. I guess I could have made it look a bit neater, but here it is. Mmm mmm! Very good, and a pretty big portion too! The scone was pretty great as well. I love scones because they’re not too sweet. Donuts, cinnamon rolls, and other sweet pastries just don’t do it for me when they are overly sweet. 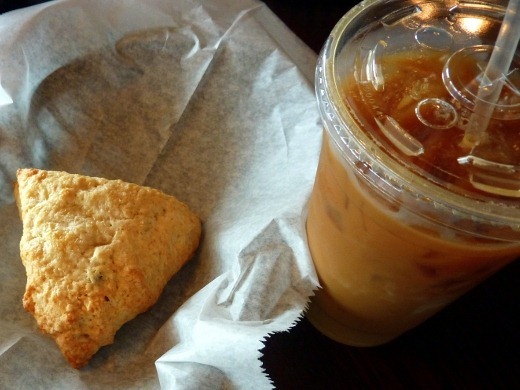 As long as I have some coffee for dippin’, I’ll take a scone over a donut, any day. This was a nice little lunch & coffee café! I’d like to go back again. Currently listening to: Heavy In Your Arms – Florence + The Machine. I hope you dropped a dime or two for the Violin Monster after you snapped that picture! Pingback: The BBQ Slaw Burger « Meg.Goes.Nom.Nom. Pingback: Beeeans and Cornbread! « Meg.Goes.Nom.Nom.